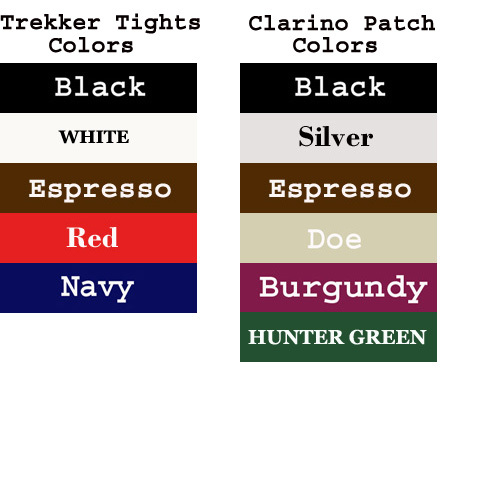 Trekkers are lighter in weight, come in many great Colors and can be used as Protective Layer under other breeches or jeans. The same style as our Racing Tights, but made with a lighter weight 4-way stretch Nylon/Lycra that comes in more colors and also supports the muscles for a more relaxing ride. They come with seat and knee pads that wick away moisture to eliminate chafing and adds a nice cushioning. Note: The pad material is not bulky or aggressive like some bike shorts can be and come up to the tail bone area for protection. Add our Custom "Sticky Buns", sueded Clarino outer seat covering, to your Trekker Tights for an extra secure ride.